Rath Yatra is a very religious event for all Hindu and Jain community peoples; also many other religion people like Muslim, Buddhist and Christian etc sometimes visit to participate in Rath Yatra in Odisha. This is the festival in which lord Jagannath, Balabhadra and Goddess Subhadra the main deities of Shree Mandir comes out from temple and start a journey to their aunt’s house for a tour of some couples of days. A huge gathering of millions of devotees brings the chariots “Raths” from Shree Mandir to Mausi Maa Mandir. 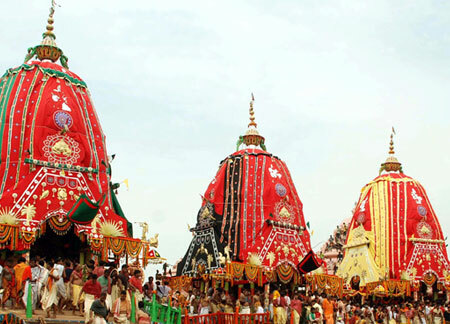 Rath Yatra Tour Package in Odisha is a wonderful chance to know more about the Puri and lord Jagannath. After arrival at Bhubaneswar Airport / Railway station, pick up, proceed to Puri, check-in hotel, relax, in evening enjoy at Golden beach and beach market. Overnight at Puri hotel. Early morning take your breakfast and full day visit of “World famous Jagannath Rath Yatra’ at Badadanda (Vehicle will be a park in parking places selected by local administration, you have to visit Rath Yatra by walk from parking Place). Overnight @ Puri hotel. (Rooftop tickets are available for enjoying Rath Yatra and ticket cost will be extra). Take your breakfast, proceed to Satapada Chilika Lake, enjoy Boat Cruise to see “Dolphins” & “Scenic island” inside Chilika Lake, back to Puri , free time shopping at a Local market. Overnight at Puri hotel. Take your breakfast, check-out from hotel proceed to Konark, en-route visit Chandrabhaga beach then visit Konark Sun Temple (World heritage site and one of seven wonders of India), latter proceed to Bhubaneswar (Capital city of Odisha) on the way visit Pipili (Applique Market), Dhauli Peace Pagoda (Famous for historical Kalinga war), Lingaraj Temple, Rajarani Temple, Mukteswar Temple, on arrival check-in hotel at Bhubaneswar. Overnight at Bhubaneswar hotel. Take your breakfast; visit Nandankanan (Zoological Park & wildlife sanctuary), Khandagiri & Udayagiri caves, Tribal Museum, Ekamra Haat & Local market. Overnight at Bhubaneswar hotel. Take your breakfast, relax, check-out from hotel, visit the local market for shopping then transfer to Bhubaneswar Airport / Railway station for onward journey with sweet memories of Jagannath Dham (Odisha). Accommodation in star hotel with AC Room in Bhubaneswar, Puri, Konark, Cuttack and Gopalpur. The Vehicle will exclusive on your Tour Package duty as per itinerary only (from pick-up to drop). Above mention car for above mention program with Driver charges, Night halt charges, Toll, Parking, Diesel expenses and Govt. tax. Boating charges at Chilika Lake. Complimentary Jagannath Darshan by our Temple priest. AC Vehicle with a well-trained driver. Exclusive Boat for your group / family at Chilika Lake. Anything which is not included in the above cost includes section. Copyright © 2019, Odishatourpackage.com. All rights reserved.